Our luxury made to measure line encompasses that personal approach to quality in a way that adds the ultimate touch to any of our bridal gowns. The chosen design will always be absolutely exclusive, with a perfect fit, made to the highest specifications. Made to measure goes beyond trends-the customer gets a one-off, unique design, made for her and for her alone. Our gowns made from only natural fabrics for a lightweight and comfortable feel, like silk gazar, silk satin, French laces and delicate embroideries. It takes three to six month to create a gown from the time of your order and require one or two fittings. We advise our bride to focus on their own style. Wear what reflects your personality. 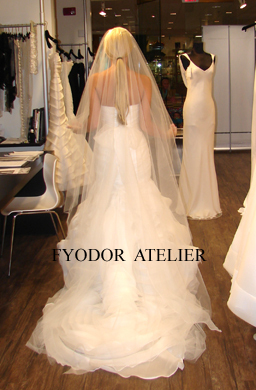 Customize your own dream dress, choose your own fabrics, add your personal touch to existing design from our collection. We have two stunning collection for bride to choose from. The bride will appreciate highly personalized attention in a stress free environment.